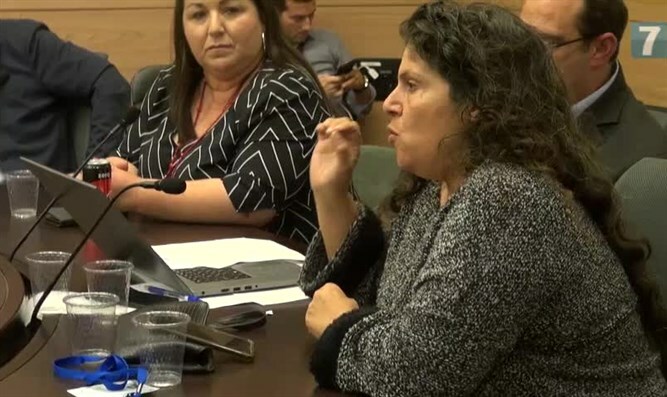 Meirav Hajaj, the mother of Lt. Shir Hajaj who was murdered in the January 2016 Armon Hanatziv attack, participated in a discussion at the Knesset Constitution, Law, and Justice Committee today on the death penalty for terrorists and demanded that MKs bring the law to the Knesset plenum and support it. "We could have saved the lives of 100 people if the murderers had received the death penalty," Hajaj said. "You can hold hearings for 100 years; I want you to set a date for the vote. I demand that each Knesset Member raise above himself. "We have a very short period until the elections, we have to advance the deterrence package. Let's stop the next attack. Miraculously the soldiers yesterday weren't killed. Take responsibility. There's no more discussion. Set a date for voting and vote. I'm ashamed. We're speculating here with the blood of our children," added the bereaved mother. Yisrael Beiteinu Knesset faction Chair MK Robert Ilatov, initiator of the death penalty for terrorists, accused the Likud and Jewish Home parties of blocking the bill in the Knesset plenum. "What happened today in the Constitution Committee is simply a disgrace. Time and again, the legal advisors simply mislead and deceive the public, claiming the law wasn't discussed by the ministerial committee and other empty and baseless claims, all to prevent its advance," said Ilatov. He said "the law went up to the ministerial committee, the ministerial committee discussed the law and passed a decision to transfer the final discussion to the coalition leaders forum, which approved the law. "The Justice Minister and the Prime Minister voted for the law, and the Prime Minister's position was clear and unequivocal. He also voiced it on the Knesset platform. Even today, unfortunately, the bill didn't come up for committee vote. Likud members and the Jewish Home are expressing themselves all over the media in favor of the law, but in the test they didn't come to vote and the law was torpedoed again. "I demand coalition leaders immediately vote on the bill and approve it for Knesset vote in first reading," added MK Ilatov.